Colin Barne's and Tedford White's "Slide Rules"
Colin Barnes' and Tedford White's "Slide Rules"
The first edition of this work was published in 1999. Since that time a considerable amount of new information has come to light, much of which is due to the researches of Ted White who has amassed a database of some 2000 examples of this calculator. Further information has been obtained from the authors' collections and from other slide rule collectors. 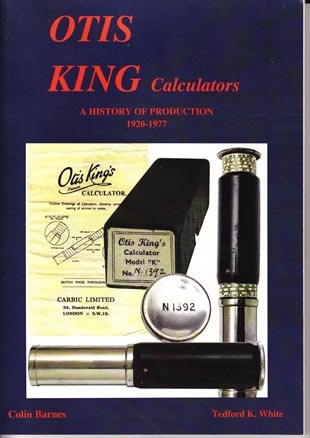 This totally revised and extended edition includes information on Otis King, Carbic Ltd. and details of the various patents. Also chapters include details of some 13 design variants, scale arrangements, packaging details, instruction sheets, a record of the evolution of bases and caps and finally an analysis of recorded examples with a guide to total production figures and dating. 100 pages A4 format, fully illustrated in colour and black and white.